One of the things most Americans can’t go without is a method of travel — usually their personal vehicles. From commuting to work, taking the kids to school, running errands, and going on vacations, it’s almost impossible these days not to own a car. One of the things on most drivers’ minds is trying to make sure that they’re getting the best fuel economy possible. Here are a few tips for doing it. 1. Start by driving the right car. Getting the best fuel economy out there means starting with the right car. Some vehicles simply aren’t capable of getting the best fuel economy, so you have to find the right one from the get go if you’re looking for the best fuel economy possible. Hybrid fuel economy is usually better than that of other cars, since they don’t burn fuel the entire time they’re driven. The 2000 Honda Insight is considered to be the most fuel efficient car ever, with a highway rating of 61 MPG and a combined city/highway rating of 53 MPG. Once you have a car that’s actually capable of getting the fuel economy you’re looking for, you also need to think about the way you drive, because that matters. Heavy acceleration and hard braking uses more gas than if you were to accelerate slowly and allow your car to coast to a stop. Speeding also uses more gas, so always drive the posted speed limit. Hybrid vehicles can be up to 35% more fuel efficient than traditional cars, but you won’t get the best of it if you don’t drive well. 3. Keep your vehicle well-maintained. 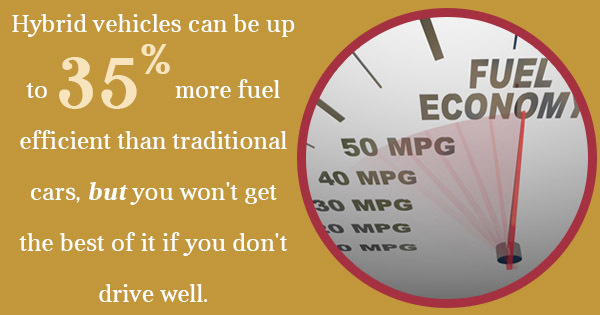 Keeping a well-maintained vehicle is also important for getting the most fuel efficiency out of your car. Make sure that your tires are always filled with air and that they’re in good shape. It’s also important to make sure that your hybrid car batteries and engines are functioning at maximum efficiency. Hybrid battery replacement is something that most hybrid owners will have to worry about, but with the savings on gas, it recoups some of the $3,000 to $4,000 price tag. Getting the best fuel efficiency starts with driving the right car, but it’s also important to make sure that you’re driving well and maintaining your vehicle.